El Fog (Masayoshi Fujita, originally from japan and now Berlin based) forms his aesthetics into sounds with the vibraphone + electronics (and with minimal use of other analogue/digital instruments). He has been influenced and inspired by electronic music, jazz, dub, hip hop, etc..., and also the silence and deepness of the fog and the mountains and the gravity within. El Fog's 2nd album is coming out in 2009, and also Europe and Japan Tours are now planned. 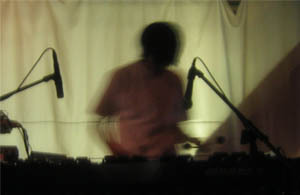 He is also a member of the experimental improvising band "Pan Am Scan". As el fog and Pan Am Scan, he went on the UK Tour with The Boats in September 2009. They also released a split tour EP Stenography from the label Our Small Ideas. Pan Am Scan is now working on their first full album.